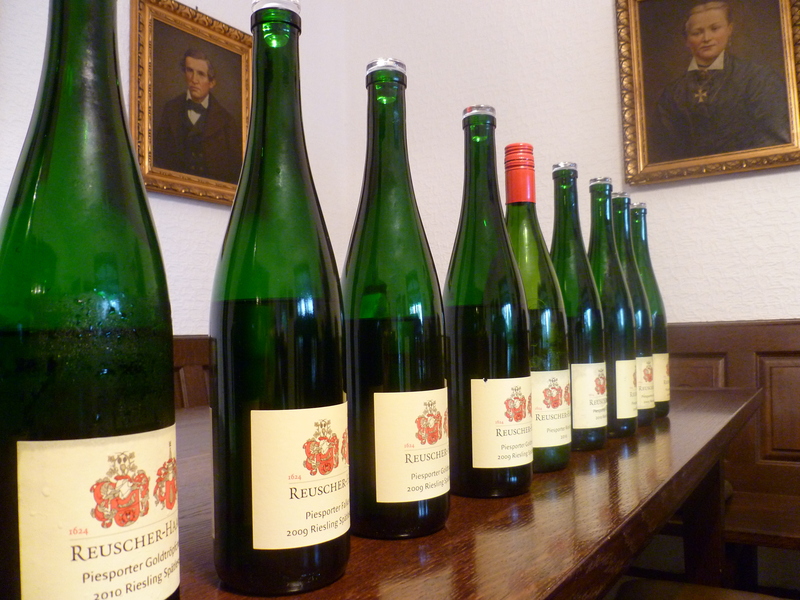 But back to the story: For June 16, I had made arrangements with Weingut Reuscher-Haart for around 4:30 to 5:00pm, right after the tasting at Weingut Dr. Hermann. We were about 2 1/2 hours into our tasting there when I realized that there was no way we could hold that time frame. I stepped outside and gave Mario Schwang, owner and winemaker at Reuscher-Haart, a call. He was more than relaxed: We should come whenever we were done. If he was not there, then his father Hugo would do the tasting. No problem at all. We are always welcome. This response gives you a really good impression of Mario. He is one of the nicest and coolest winemakers I know. Ever since our first tasting there in 2011 he has let us know that we are always welcome, whenever. 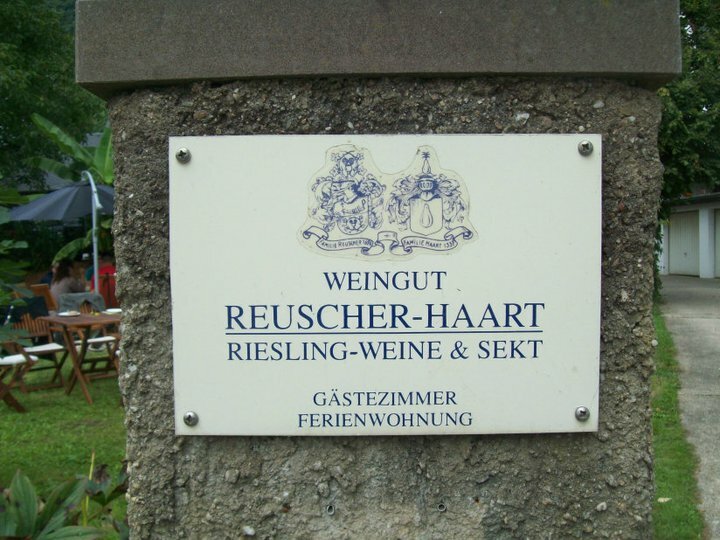 The Reuscher-Haart winery has a long history. The two families date back to 1624 (Reuscher) and 1337 (Haart) respectively, and the coat of arms on their labels bring that home. 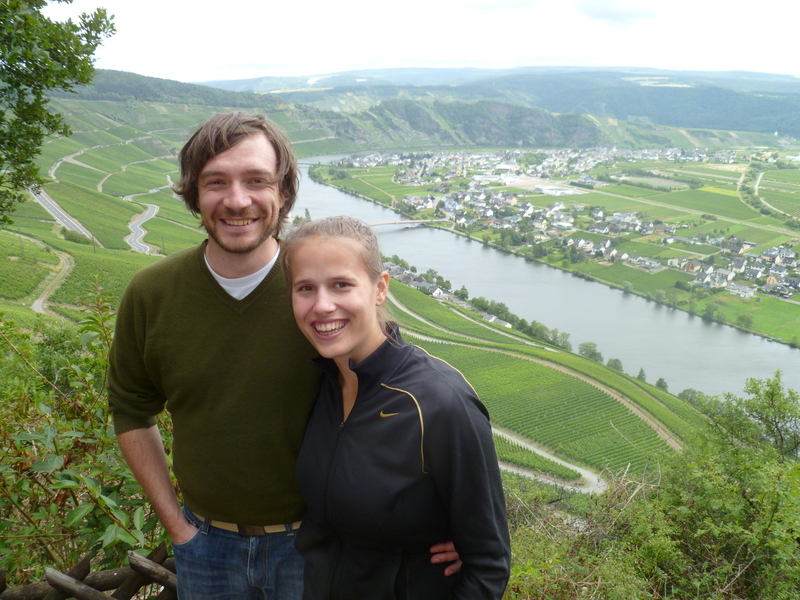 The winery is still located where the seat of the Haart family was, with a garden adjacent to the Mosel. The merging of the families happened in 1919 when Elisabeth Haart married Matthias Reuscher. Their portraits adorn the tasting room, too. Mario and his father Hugo have a very clear vision: They have cut back on their yields to increase quality in their grapes, and since 1987 they have been using integrated, natural methods of protecting their grapes without inescticides. The vinification also happens in gentle steps: Reuscher-Haart owns temperature controlled stainless steel barrels that lets Mario and Hugo use very low temperatures (5 to 8 C) in fermentation to preserve natural aromas. 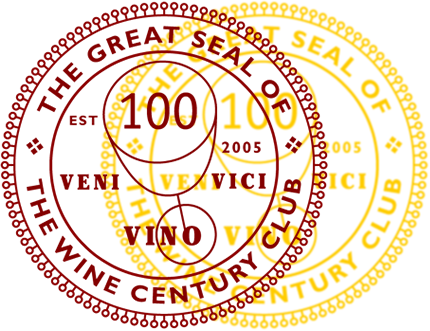 They clarify their wines without any clarifying agents. We first came in touch with this winery through my friend ManSoo (whom else?). He suggested stopping by there and our first wine tasting in June 2011 was awesome. First, Mario’s father Hugo took us on a Vineyard Safari in their old Land Rover. 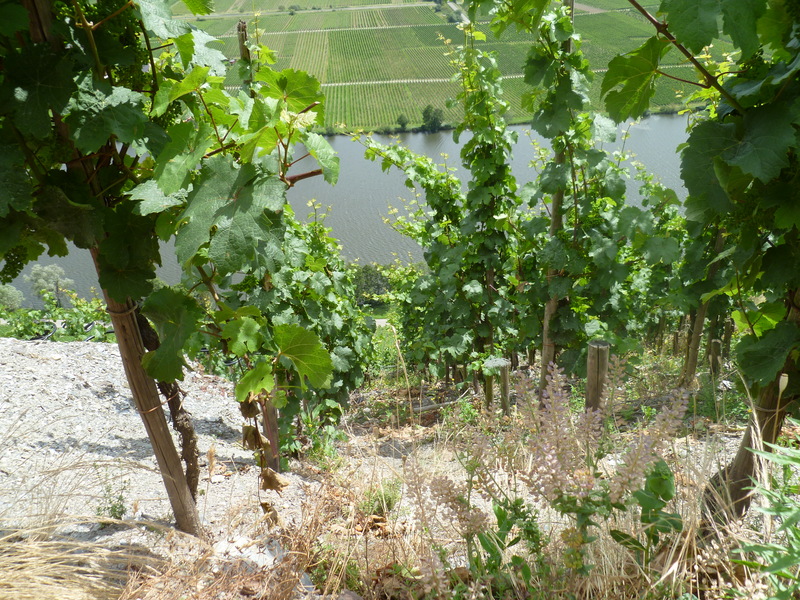 We drove through the Piesporter Goldtröpfchen, stopped occasionally and Hugo filled us in on their gentle approach to cultivating vines, and what the work in the vineyards means for the winemaker. After a good hour or so, we headed back to the estate and had a tasting with Mario. Not only did we have a lot of fun, we also liked their wines a lot. The basic Gutsriesling is probably the best price-value bargain you can get at the Mosel (I mentioned it previously here). We had been back for their wine presentation in August 2011, and Nina took some of her visiting friends there and had a great time, too. 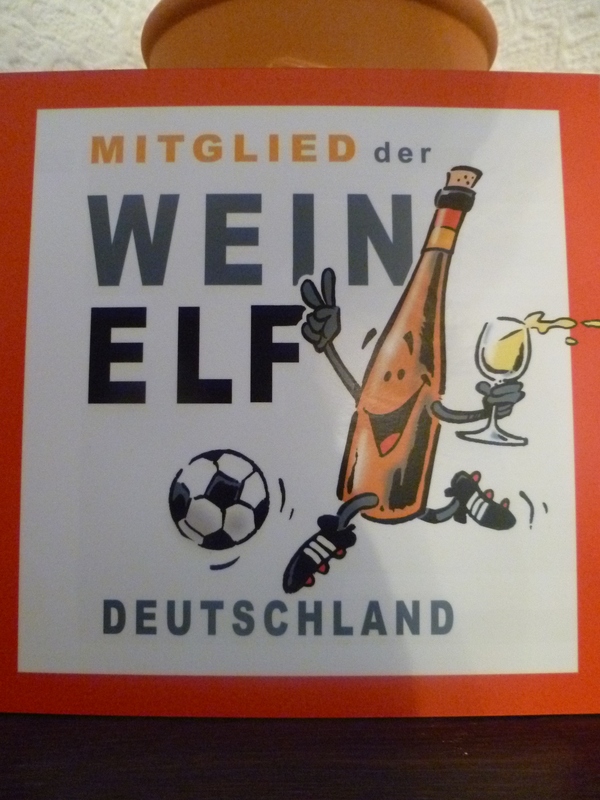 Member of Germany’s wine soccer team! Mario had to run some errands, so we tried the first wines with Hugo. It is always interesting to get a glimpse into the relationship in these family businesses. While Hugo is obviously very proud of Mario and his work, he is still very much involved in day to day decision processes. The latest contention they had was about labelling. Mario has tried out a new label design for one of their export bottles to the U.S. and Hugo was not fond of it. The cool thing was that we got to discuss the virtues of both approaches, and that there are no hard feelings involved. It is a dispute about how best to present their products. Their newest project is the planting of a new grape called cabernet blanc. Hugo explained that it is a new crossing between cabernet sauvignon and resistant grapes. Its main advantage is that it is fungus resistant. The berries are small and leave room for air between the grapes. In taste, it is being compared to a mix of sauvignon blanc and riesling. I am already curious about the results. We tried a total of nine wines that evening and were very happy with what we got to try. I will write about some in seperate posts. If you are unclear about what some of my designations mean, check out the at a glance sheet on German wine classifications. We began with their dry wines. Most of them had not been bottled yet (Mario and his father believe in late bottling, given the wines as much time as they need to ripen), so we just went with the two 2010s they still have available. The 2010 Piesporter Falkenberg Riesling Kabinett had aged quite nicely: good fruit, very fresh still, nicely long in the finish. The acidity was pleasant. 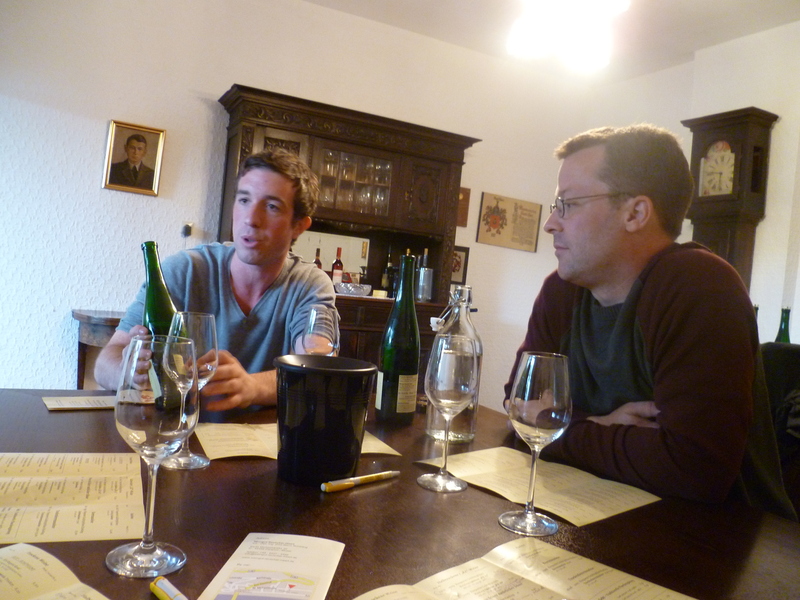 The 2010 – Urgestein – (a dry Spätlese from the Domherr) was awesome. Coconut in the nose it was a powerhouse on the tongue with a forceful acidity. Very impressive. The two semi-sweets were both Spätlesen from the Goldtröpfchen. The 2010 Spätlese RZ 13 had nicely aged, but was not really my taste. I would have wished for some more sweetness in the wine. The 2011 “Überschwang” was a beautiful delivery of a classical Mosel riesling with a fruity nose with a not overbearing sweetness. I compared their dry and sweet gutsriesling in a seperate post here. Their sweet wines of 2011, though, were all very impressive. The Goldtröpfchen Kabinett had apple notes, was very fresh with an awesome amount of acidity and will probably be good for a while. There were two spätlesen from the Goldtröpfchen, one with 9% ABV and the other with 8.5%. The 9% ABV one was incredible: gooseberry and tons of tropical fruit on the nose and with the same notes on the tongue. It was fresh and is well worth storing. The 8.5% in contrast, had hints of sauerkraut on the nose (yes, that was weird!) and seemed a whole lot sweeter on the tongue. I think it needs a bit longer to settle and show its true colors. We had to rush out to get to see the match, so we did not try their blush and red wine of 2011, but I remember the 2010s as pretty decent, too. It was great seeing Mario and Hugo again, and I wish we had had more time to spend with them. They are both visionaries and it is great to learn from them. I look very much forward to our next encounter and what they will come up with next. Mario speaks great English, so don’t hesitate to go visit! And make sure you ask for the vineyard safari. You can find Reuscher-Haart wines in the U.S. German and European readers can order their wines through the winery website. Pricing is quite reasonable, and the wines are well worth the money. Thanks so much!! I’m glad you like it. It was tons of fun.